Hey guys and happy Wednesday! I hope that everyone has been having an amazing week, and month of April. If you are visiting me from D. Violet Interiors, then welcome! April is my favorite month, not only because it marks the beginning of Spring, but because it’s my Birthday month! Woot Woot! But enough about that, let’s go straight into what you are really here for, which is to finally see my upstairs hallway reveal. If you follow me on Instagram, then you’ve seen some of my sneak peeks of the space. I absolutely love how this space came together. I always look at hallways as being one of those areas that people tend to forget about, or look over. That was definitely the case with my upstairs hallway. It was dull, drab, and while it was the gateway to all of the rooms upstairs, I never really thought about jazzing it up. Well as you can see, that changed….but it didn’t happen overnight. I started the board and batten in the hallway around Christmas time, and the project pretty much stalled. Then myself, along with some of my blogger friends figured it was time to come out of the winter rut, and Spring our butts into Action by finishing up a project that had been placed on the backburner. This was just the motivation I needed to finish up this project and bvelieve me… I needed the motivation! So before we get going with the full reveal, let’s take a look back and see where this space started shall we? Believe it or not, the hallway was painted the same color as the rest of my main areas, but it did not translate well in the space. So dull looking. I knew I needed something to brighten up the space, which is why I gave board and batten a shot! I love how molding brightens a space for so little money. After adding more decor pieces, my hallway finally came together. Check out the same view today! I can barely believe the difference myself! I love my family so much, and what better way to show the beautiful faces that I live with than family photos. I love pictures and display them wherever I can. My house is not a museum so family photos are a must for me. The rug is from Wayfair. Since the hallway is narrow and long, I purchased this in the 2×16 size. I love that it finishes off the space. I wanted to break up the photos with a little bit of artwork, so I snagged this beautiful abstact piece from Homegoods. I love the pop of color it adds. I also knew that the very end corner needed some greenery. Because this area lacks any windows, a real plant was out of the question, plus I don’t need another plant to water. I opted for a faux plant in this space and it was the perfect addition. Don’t be afraid to add faux greenery to your hallway. I love having something “greenery” related in every space of my home. Adds a bit more texture and life in my opinion. To add even more interest, I framed some buffalo check fabric. Easy and cheap artwork that flows along with the look that I wanted to achieve. I can’t forget about the frame detail. I didn’t want to keep the frames plain and white. Too boring for me, lol. So I opted to add this campaign style details around the edge. I accomplished this look with 1/4 inch corner brackets from The Home Depot and spray painted them gold. You can keep them silver though. It’s all a matter of preference. I still have to put up my other hallway light fixture. I bought both, just haven’t put both of them up. I will probably have my husband put it up this weekend. There are also a couple of areas I need to touch up with white or gray paint, but overall the space is DONE and I am happy with it. So what do you think? Do you think you will show your own hallway some love? I have to be honest that this has me giving all of my other hallways a major side eye, so I am expecting that they will get some love in the near future;) I will also put together a full board and batten tutorial, as I did this project for under $50 in materials! 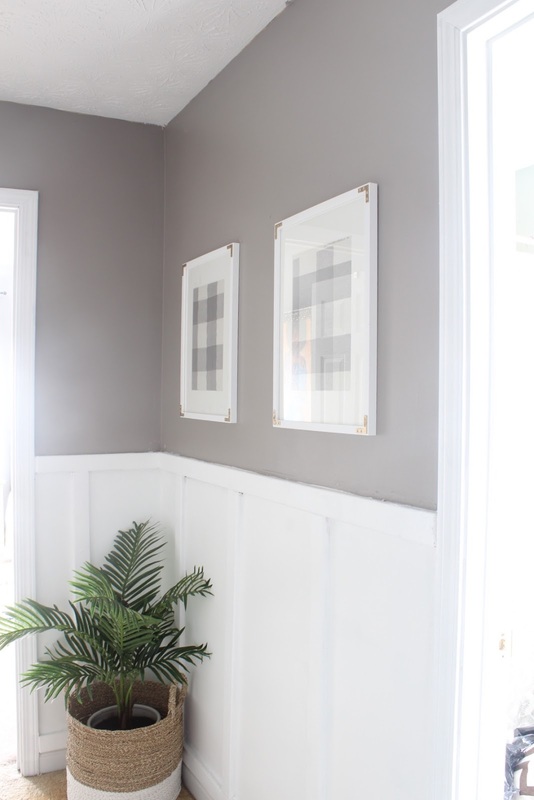 Next, head on over to my friend Carli’s blog and check out the reveal of her “mudroom” area. Carli NEVER dissapoints. Don’t forget to check out all of the other ladies in the blog hop! You are going to love their reveals. Also, don’t forget to check out our hashtag #springintoactionbloghop to check out the progress along the way. Thanks so much for stopping by! Until next time! Erin you outdid yourself!!!!! 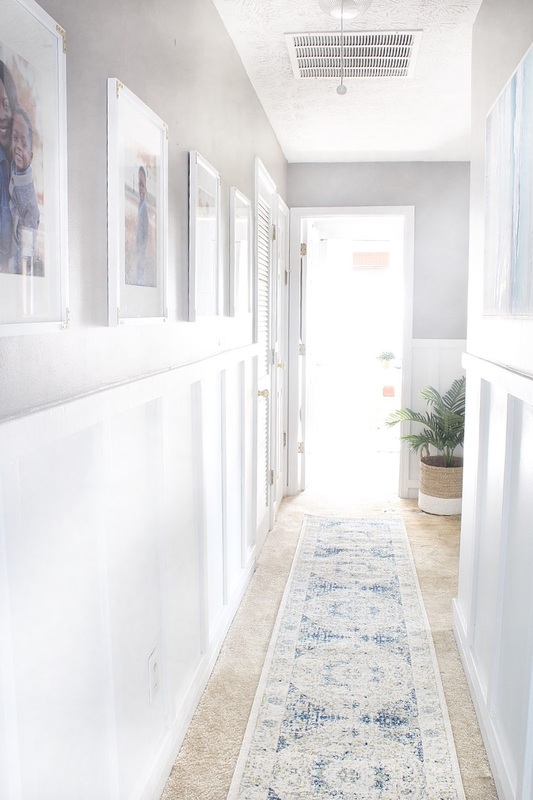 This hallways looks absolutely amazing and I love the personal touches from your family photos!!! Makes everything that much more special!! What a transformation! So beautiful! Love how bright and airy it is, and the white frames look so crisp on the new wall color. Love what you've done! This is one of the prettiest hallways I've seen in a long time. Well done! Looks fantastic Erin. I am thinking I need to add a runner to our upstairs hall as it's hardwoods and so loud! LOL Love the detail on the frames. How did you adhere them? Thank you Lauren. I just adhered them using some crazy glue! I love the hallway! It looks so good! That paint really brightens it up, along with all the white frames! Girl this hallway is everything! I love how the board and batten brightened up everything. Your baby boys is so cute, such a beautiful family! job well done boo! Thank you Arie! I appreciate your kind words. Oh my!! What a wonderful difference it made.. looks absolutely wonderful!! I love how the artwork and family photos blend and the rug is the perfect balance of color. Great job on the makeover. thank you Jamala! Thanks for stopping by. This is beautiful Erin, I love the pop of blue. As well as the gold details on the frames. Gorgeous! It is so light & bright and really draws you in. Of course the family photos are EVERYthing – the frames turned out great too! I've been wanting to try board and batten but the hubby isn't convinced – I'll have to show him yours! Ha! Thank you. Hopefully he gets on board! This hallway is so bright now. Great color choice. The board and batten adds interest to the wall. And you can't go wrong with family photos, especially of your cute family! This is so fresh and beautiful. I love the calming vibe of the color scheme. This makes me want to do my hall way, but I have too many anges to even thing about board and batten. Thanks Kenyatta. Yeah, angles would definitely be a pain to work around. Such an amazing transformation! I love the board and batten, it really adds so much style. Wonderful work! Thank you so much Libby! What paint color is this? So beautiful! Thanks again. The paint color is Fashion Gray by Behr. WOW! Erin, I seriously love everything you do in your home and this no project is different. I love how bright and white the space is now. The detail on the frames is one small detail but it gives personality to the entire space. You are killing it this year, Erin! Keep going…I'll be here in Louisiana soaking it all up. Thanks Crystal. I love your project as well. I appreciate your kind words! 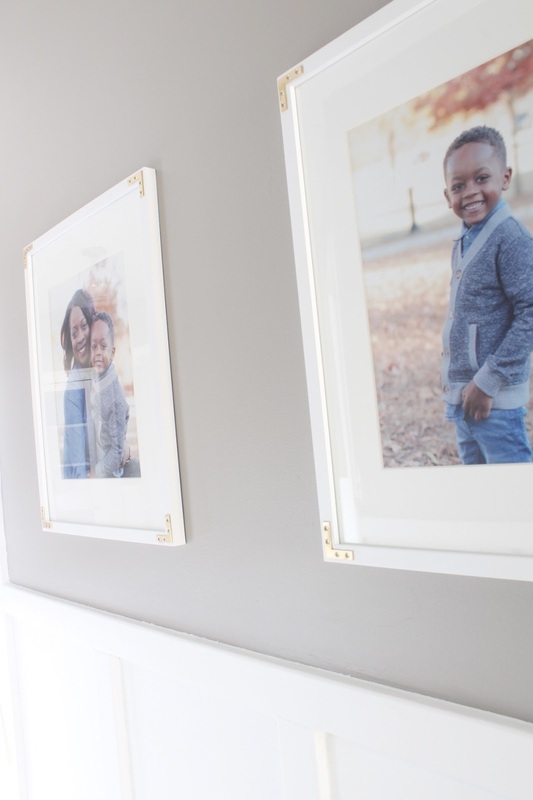 Erin, oh my gosh, what a difference the board and batten and your beautiful family photos made to brighten up this hallway! I love how it came out! I love that little corner bracket detail so much and have to borrow that idea from you!!! Thank you Lisa! Thanks for stopping by.